Vivitek Qumi Q3 Plus Pocket Projector Review | Nerd Much? Taking into account how many portable projectors are on the market now, it’d be hard to believe that you haven’t seen one in your travels by now. But, in all honesty, the majority of those projectors are gimmicky, with marketers solely relying on their “cool” factor to sell, entirely ignoring quality. Vivitek’s Qumi Q3 Plus, however, is a top-notch option for those looking for a portable media solution that doesn’t require a TV. With the Qumi Q3 Plus, you get native HD720p resolution (1280×720) and an impressively bright 500 lumen brightness, with a 5,000:1 contrast ratio. The light within allegedly lasts for 30,000 hours before it needs a new one (obviously, we’re not going to take the 30K hours to test that). It also has a 1.5GHz quad-core CPU and a skinned Android Kit 4.42. It also sports a built-in 8,000mAh rechargeable battery for a solid two hours of use (and it can be used while charging with the included AC adapter). In our testing, the Qumi Q3 Plus lasted for that two hours, which means you won’t need to locate a power outlet to watch a movie. The Q3 Plus works well with many different input sources, including HDMI (1.4), USB media drives, flash drives, and MicroSD cards. What’s more, it has an impressive 64GB of stock memory — more than most smartphones — allowing users to store numerous video files and documents without the need to carry anything extra. To boot, anything you can display on your Android or iOS can be displayed with the Qumi Q3+, thanks to a streaming app called Happycast, which is great for use with presentations. There are a few notable design improvements that the Qumi Q3 Plus adds to the portable projectors before it. First, the focus tuning is done with simple +/- buttons, eliminating the scroll wheel that we see in most models. Its only benefit really is the change in the aesthetic of the device itself, but it’s still appreciated. 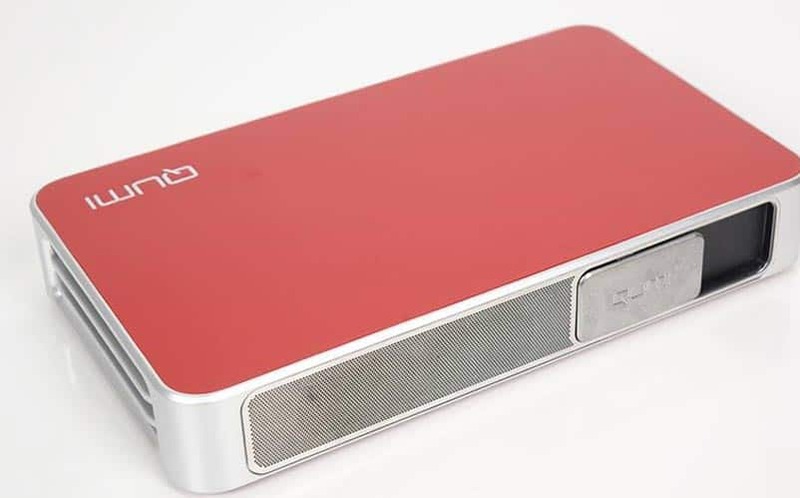 Of course, it’s the Qumi Q3 Plus’s Wi-Fi connectivity that makes it such a great portable projector, as you can download all of your media apps with ease, as well as updates. As far as what apps are available, it has a pretty decent selection of the top media-playing apps like Netflix, Hulu, Amazon Prime, Mobdro, Vudu, ABC Now, Fox Now, and a few others. You can also find some of the top Android media apps (it runs on a skinned Android OS) like Plex with a simple search in the store (for some strange reason, Plex isn’t actually listed in the Entertainment section of the device’s store). All of these apps are free, and in our testing, they each worked flawlessly. Also worth noting is that, although it has onboard speakers, you can also use any Bluetooth headphones or speakers for better sound — something you simply don’t see much of in the projectors market. This is important because the stock speakers simply aren’t loud enough for a viewing party (although they’re adequate for most other purposes). The device itself is slightly quieter than most projectors we’ve tested, although it isn’t exactly silent, either; you’ll know it’s in the room, but it’s quieter than, say, a small box fan. 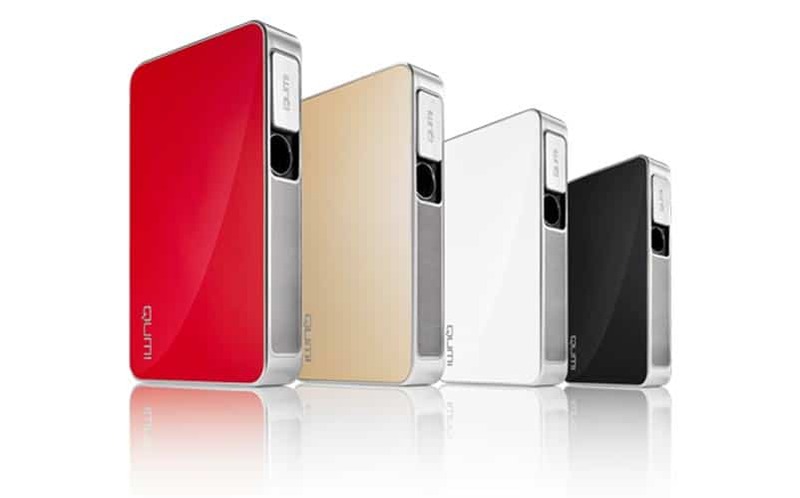 The physical device, itself, also looks great, coming in at about the size of a standard 3.5″ hard drive It has a silver base with a colored top and bottom (ours is red), with ports in the back and the lens, lens door, and speakers on the front. The sides are ventilated, so the device won’t overheat while using. These side grilles give the device an almost retro look. On the bottom of the device, you’ll find a small kickstand that angles the device upwards slightly. It comes with a small remote that’s simple and easy to use. As far as the device’s picture quality is concerned, you’re really getting a high-quality image that’s impressively bright and vivid, even in a full-lit room. Watching movies from Plex and Netflix worked flawlessly, at full speed and with no hiccups or lag of any sort. My Xbox One S and PS4 both work effortlessly with the Q3 Plus, with games remaining colorful and crisp even at bigger sizes (obviously, you aren’t getting 4K quality you would with a TV, but it’s still HD quality). Even documents with smaller text were displayed clearly and concisely, making it a great option for business and school presentations. The Qumi Q3 Plus is surprisingly formidable for a brand name that isn’t exactly a household name just yet. Its only real flaw (its low volume speakers) can be rectified with the simple addition of any Bluetooth speaker, making it a solid option for not only presentations and business purposes but also movie night and gaming. You can pick up the Qumi Q3 Plus on Amazon for $323.